Many members take photos of Club activities and events, as well as photos of Alcova Reservoir and environs. Members often ask others to send them photos via email or text. Wouldn't it be great if ALL members had one place to post photos for others to view and download? This project is an attempt to do just that. Google Photos is an online application that allows many people to upload their photos to the web for others to view and access. In order to upload photos, you will need a Google account (gmail account). If you have a gmail account, you're all set. If not, you can set up a gmail account online here. DISCLAIMER! Please note that this project is an experiment! There is no guarantee that this project will work as imagined. In addition, you should keep the photos page link provided here as private as possible. Anyone who has this link can view/upload photos - not just CBC members. For that reason, the webmaster for casperboatclub.com retains the right to delete any photo that is unrelated to CBC and/or in poor taste. Remember these photos will be able to be viewed by anyone who has the website link (see Step 1). So think before you upload please. Scenery, people activities, action photos, wildlife, etc. would be good photos to post. When posting photos of people, it is a good idea to ask them permission to post (if they are recognizable in the photo). Use common sense and the Golden Rule when deciding what photos to post. Finally, because the photos you post are associated with your Google account, photos you post will automatically have your name attached to them. If it all works and people are successful in posting their photos, it could be awesome! If you feel you are technically literate, feel free to skip these instructions and go directly to the weblink to start uploading your photos and viewing photos of others. If you feel you need some help to upload your photos for others to see, the following instructions may help. It's nearly impossible to have instructions for every set of tech that's out there, so these instructions are based on using a computer/laptop. However, reading through these instructions, may help you figure out how to use a mobile device to accomplish the same. Step 1: Open your browser and go to this website. Please note, you will need a gmail account. If you have one, great. If not, and you need a google account, you can get one here. 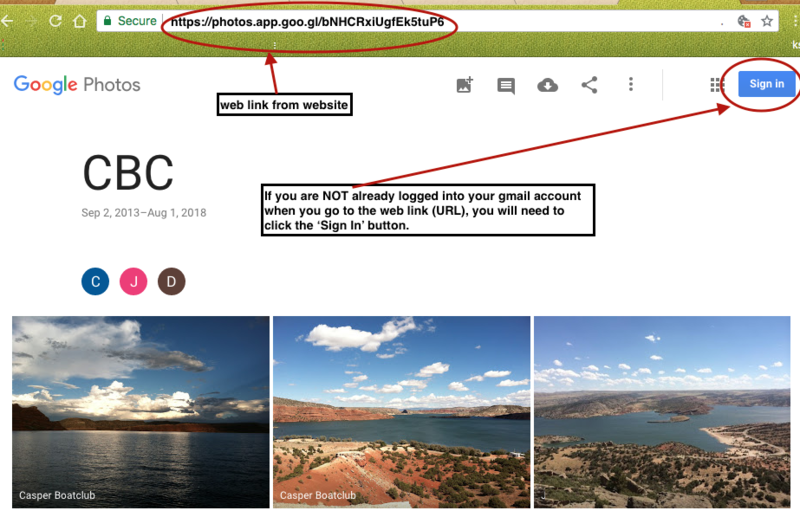 Step 2: Once at the Google Photos website, you should see CBC with a 'Join' button and some photos (if you are already logged into your google/gmail account). If you are NOT logged into your google/gmail account, go to Step 2A. Step 2A: If you are NOT logged into your Google account, you will NOT see a 'Join' button. Instead, you will see a 'Sign In' button in the upper right corner. Skip this step if you see the 'Join' button. Step 3: Once you "Join" the CBC photos album site, you can then upload photos. Click the 'Add Photo' icon in the upper right. Step 4: If you have photos associated with your Google account, they will appear here. 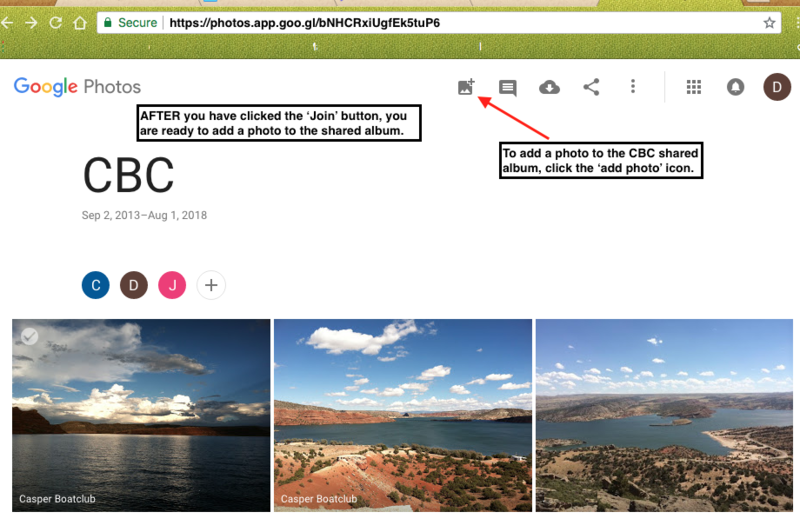 Either click on a Google photo to add to the CBC shared album, or click on "Select from Computer," to upload a photo from your computer/laptop. Step 5: If you selected, "Select from Computer," a window will appear which allows you to access photos on your computer/laptop. Navigate to the photo you want to upload and select it. Google Photo App will automatically upload the photo. Check progress in the lower left of the browser window. Once complete, you photo is uploaded to the CBC shared album. Step 6: You can view, comment on, or download photos from other CBC members. If you have questions about how to view or upload photos to the CBC shared album, please contact Dave at this email. A reminder: the casperboatclub.com webmaster reserves the right to remove any photos/comments deemed not representative of the values of Casper Boat Club.